Introduction to programming and computer science., by Prof. Brian Harvey This course exposes students to techniques of abstraction at several levels: (a) within a programming language, using higher-order functions, manifest types, data-directed programming, and message-passing; (b) between programming languages, using functional and rule-based languages as examples. It also relates these techniques to the practical problems of implementation of languages and algorithms on a von Neumann machine. There are several significant programming projects, programmed in a dialect of the LISP language. 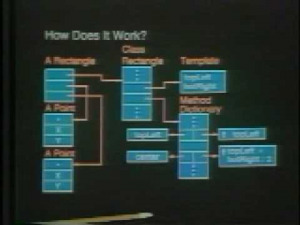 Snapshot from Lecture 18: "Object-Oriented Programming II".